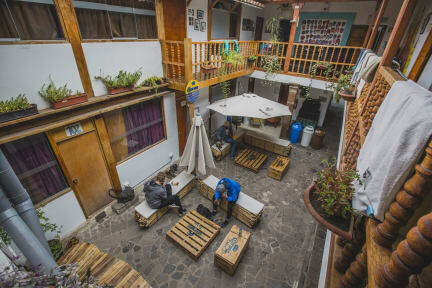 Das Yamanyá Backpackers Hostel Cusco befindet sich direkt im historischen Zentrum von Cusco, in einem wunderschӧnen republikanischem Gebäude und heiβt dich mit offenen Armen,warmen und bequemen Betten, Frühstück inklusive, Wi-Fi und Internet, heiβem Wasser und einer riesigen Gästeküche willkommen. Spiele Billard in unserer Hostel-eigenen Bar, genieβe einen Film auf unserem High Definition Bildschirm mit DVD, entspann dich in unseren bequemen Aufenthaltsräumen â¦ oder für etwas Abwechslung buche einen Ausflug bei Yamanyá Tours direkt bei uns im Hause. Wir bieten eine groβe Auswahl an Touren und Veranstaltungen in Cusco, ins Heilige Tal und nach Machu Picchu. Ausflüge: Nach dem wir dort einen zweitägigen Ausflug gebucht haben, wurde uns der zu zahlende Preis in US Dollars gennant. Jedoch mit dem Hinweis auch in peruanischen Soles zahlen zu können. Unerwähnt blieb jedoch, dass sie einen eigenen Umrechnungskurs verwenden, der das ganze um einiges (!) teuerer gemacht hat. Ironischer Weise konnte man an dem auf Nachfrage genannten Geldautomaten, nur Soles abheben! Es wurde keinerlei Kompromissbereitschaft gezeigt. Wir empfehlen „what a Trip“ nicht! „Home is not a Place, it’s a feeling“ This slogan describes our stay perfectly. We stayed 5 nights in the Kokopelli and felt completely comfortable. For us Kokopelli was a home away from home. Our dorm as well as the bathrooms were very clean, the food was really delicious and the staff super friendly and always willing to help us. They offered different services, such as laundry service, tourist information and a storage room which were really helpful. Thank you very much! The best hostel I've ever been to. Very friendly staff, beautiful private room, yummi breakfast, helpful travel agent for all trips around Cusco. Absolutely great! Thanks to all Kokopelli staff. In total I stayed there for 6 nights. They offer a free luggage room, have nice activities and even give you the option for lunchbox instead of breakfast in case you need to leave early in the morning. The deluxe rooms have curtains and the bathrooms are clean and pretty new. I would totally recommend this place. It's about 5min walk away from the plaza de armas. They have their own travel agency where you can book most of the activities in the surrounding of cusco. One of the best hostels that I have been in Peru. I liked especially the two galleries in the inside; gives it an ancient but awesome touch! Ich war anfangs im 10 Bett Deluxe Zimmer mit den Vorhängen und dem kleinen Spind, was ich sehr cool fand. Die Bäder hätten ruhig etwas häufiger geputzt werden können. Dafür war das Frühstück klasse. Personal war ebenfalls sehr freundlich. DO NOT BOOK THE TOURS IN THE HOSTEL! The tours offered in the hostel are up to 50% more expensive than all the others plus the girl doesn't really help or listen to what you like, you have to be really specific to get what you want. Just don't do it! The hostel itself is really nice I like the curtains and lockers in your bed! It's really clean and easy to meet people!. The staff is nice as well. I feel like all the extra services are a little overpriced like towels or laundry. Was really nice stay. Only during the day they had a lot of construction work. Was a little enoying. But would recommend any time!